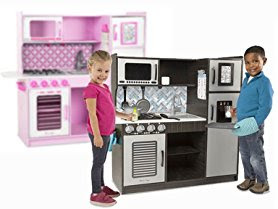 Today (5/8) get this Melissa & Doug Chef's Kitchen for only $129.99 (Reg. $179.99)! Two color choices available. Easy to assemble charcoal-colored wooden modern play kitchen--roomy enough for multiple kids to play at once. A refrigerator/freezer with innovative working ice maker that dispenses two included "ice cubes"